A woman told a court yesterday that she could still hear the sound a man’s head made as it “bounced” off the ground during a brawl outside an Aberdeen bar. Erica McLennan told the High Court in Aberdeen that she looked out of her window after hearing the disturbance in the city’s Hayton Road, Tillydrone unfold – and that she felt most sorry for the man wearing a plum jacket, who was being “taken out of the equation”. 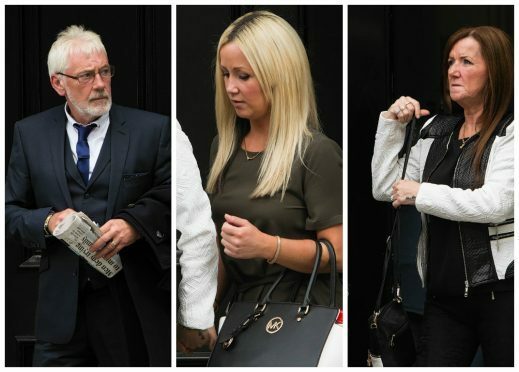 Matthew Boyle, 42, and Kevin Deans, 40 are on trial accused of attempting to murder the Gallagher family, from Inverness, by repeatedly stabbing them after a charity night at the Broadsword bar. The pair allegedly attacked John, 64, his wife Sylvia, 55, and daughter Charlie, 30, with a knife and left them with permanent scarring and life-threatening injuries. The pair deny the charges. Boyle – who the court has heard was wearing a plum jacket when he was arrested – has lodged a special defence of self-defence and claims he was attacked first. Yesterday, Ms McLennan told the court that her former address used to overlook the bar and she had seen parts of the evening’s events unfold on August 29 last year. Giving evidence, the 47-year-old said she was used to hearing disturbances coming from the bar, especially at weekends. Miss McLennan said that on this occasion the pub had been especially quiet until just after midnight. She said while she looked out her bedroom window she could see a group had formed in front of a silver people carrier which was partially obstructing her view. Miss McLennan added that after the man hit the ground she watched two women stamping and kicking his head. She said when the attack was finished the man picked himself up and “tried to explain something” in a “non threatening manner” before he walked off. She said at this point a woman in a “luminous” top sat down on some steps nearby and said she had been stabbed. When asked who, if anyone, she had sympathy for that night Miss McLennan said “the man in the plum jacket”. The trial, before Lord Burns, is expected to continue on Monday.